Staying in is the new going out! 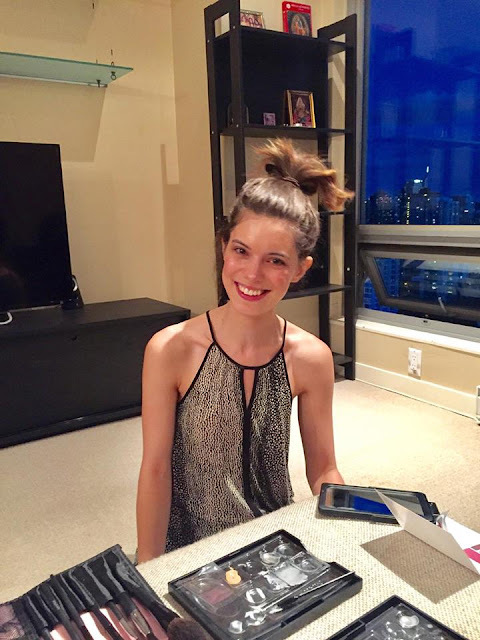 So, when my friend Sandy, a beauty consultant at Mary Kay cosmetics offered a pampering session for me and my friends I jumped at the opportunity and decided to host a fun girl’s night-in at my apartment. The BollyX Fitness class that I attend every Tuesday presented the perfect opportunity to host this event on a Tuesday evening. 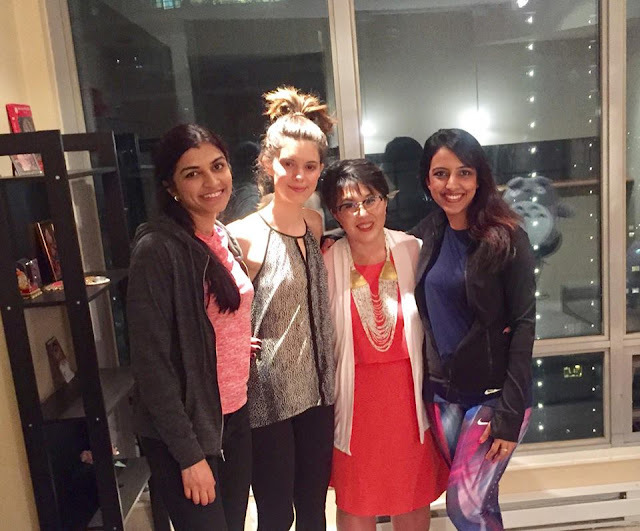 My two favourite girls Shwetha (the BollyX instructor) and Dani were happy to join me for the pampering session after the class. At first, they were a bit skeptical about the brand but my ex-roomie had already introduced me to their line of cosmetics and swore by its products. To make this blog interesting I’m going to narrate the whole episode through pictures. Sandy was a thorough professional and came prepared to make the night fun and interesting for us. She arrived right on time and set the stage for what was an eventful evening. While she was arranging the table for us, she got us to fill a form outlining our basic face and skin attributes to help her understand the right products for us. Since we all had our make-up on, the first step was to clean it off. And here we tried the first product of the evening, Mary Kay’s eye make-up remover. 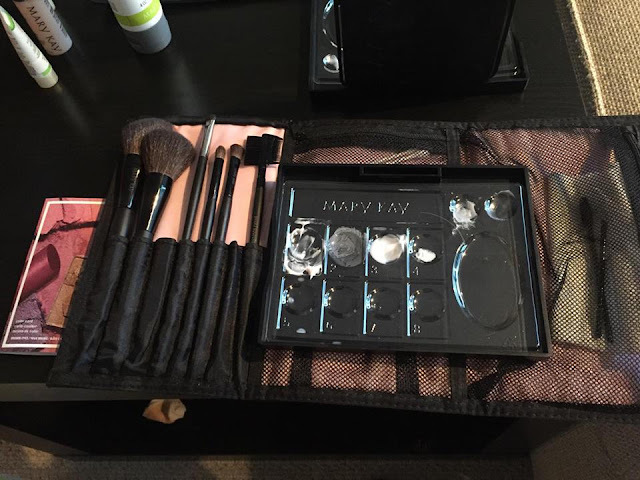 I personally feel this is one of Mary Kay’s finest products. It is gentle on the skin and takes off-makeup like a hot knife through butter. The product to follow was the TimeWise 3-In-1 Cleanser that cleanses, exfoliates and hydrates the skin. It did leave a pleasant effect on my skin. We also gave our lips a little treat. The Shea Sugar Scrub and Shea Butter Balm offered a spa-like indulgence for our lips in two easy steps. It was time to try the main product of the evening. One of the new members to Mary Kay’s family, the Charcoal facial mask that reduces pore sizes, reduces oily skin around the T-zone and extracts blackheads. 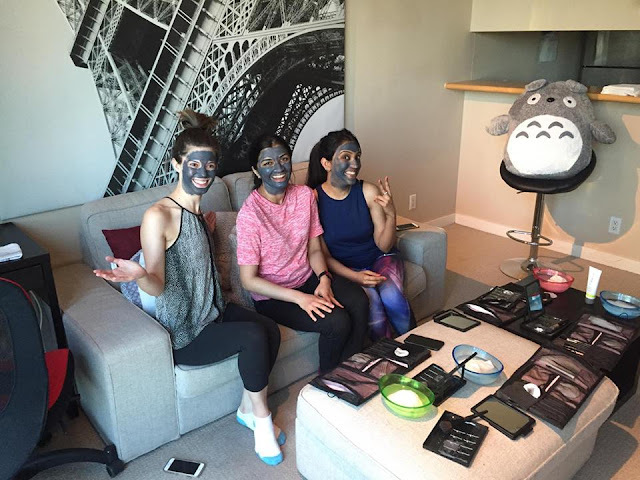 Charcoal face mask have been gaining popularity in the beauty industry these days. It’s also been used in spas all-over and therefore I was super excited to try one out myself. The fact that a product made of charcoal is used to enhance skin is itself intriguing. This was the fun part of the evening. 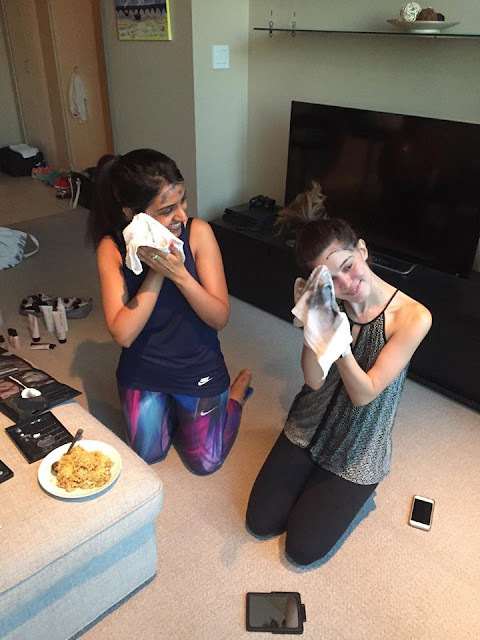 We couldn’t stop laughing at each other’s amusing faces after applying the mask. Look at the picture and you’ll understand why. We had to keep the mask on for 20 minutes, so this gave me the right opportunity to prepare a quick snack. I had pre-planned to make Bhel an Indian savory snack. The chutneys (dips/sauces) were prepared in advance, I just had to mix all the ingredients together. I’m glad that everyone enjoyed it! Just when the Bhel was ready it was time to take off the masks. The best was saved for the last! And so, we started the make-up session. It was a step-by –step tutorial from our expert Sandy. We started off by applying a moisturizer and a foundation primer (Sunscreen SPF 15). This set, the perfect base for our make-up to be followed. 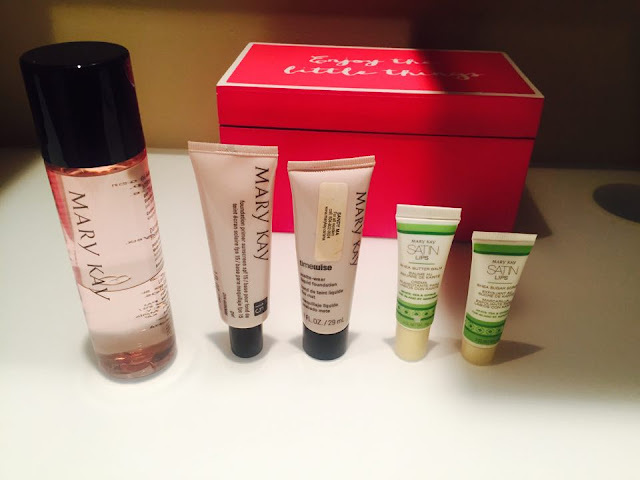 The Mary Kay foundation was a clear winner among all the products. We found the perfect shade of foundation to blend with our natural skin tones. The look was a polished version of our natural self. 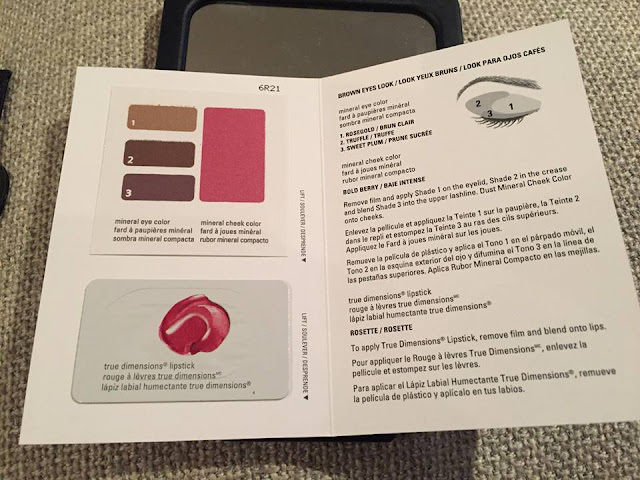 To make our jobs easier the eye make-up was provided with an easy to follow make-up guide. Sandy ended the session with a fun game in which we won some cool gifts. 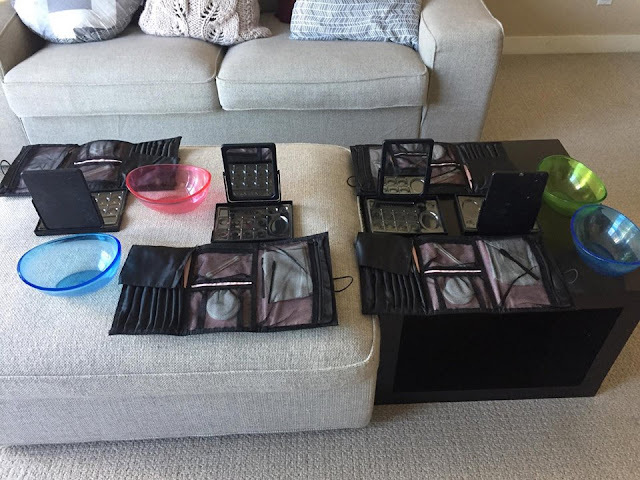 No prizes to guess that the gifts were Mary Kay products. It was a win-win situation for all. 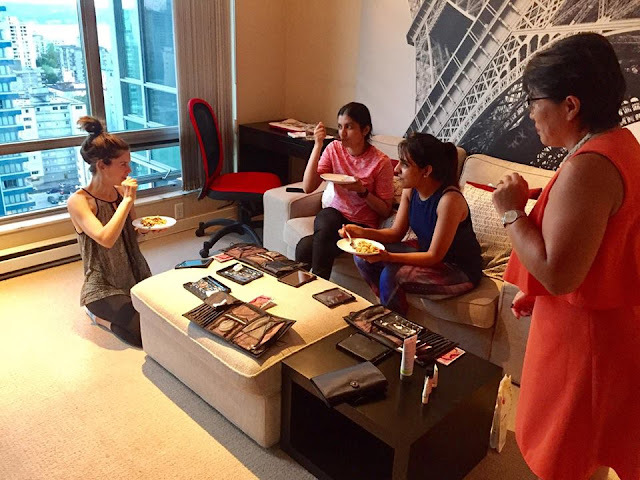 It was a fun-filled evening of pamper, indulgence and gossip! 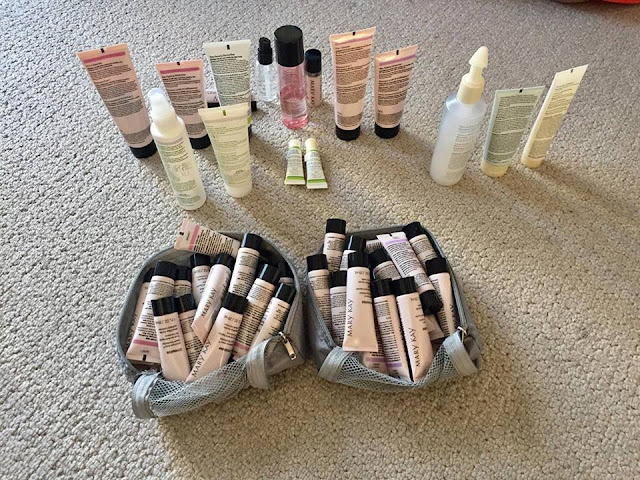 All of us ended up buying our favorite Mary Kay product from Sandy. If you’re having a small and cozy soiree with your girls, a pampering night is a lovely way of relaxing and spoiling yourself. 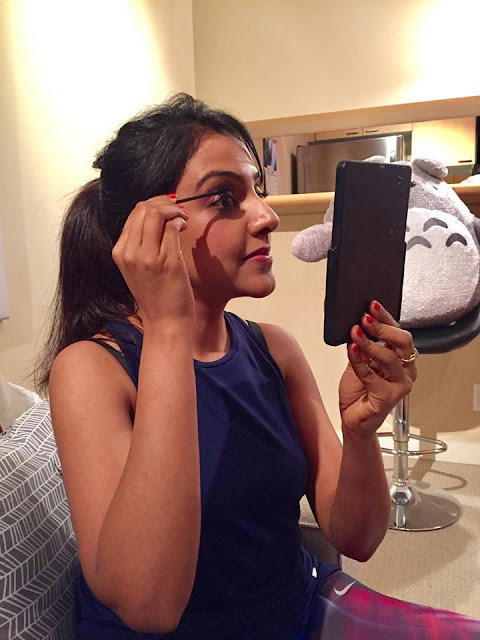 Whether you’re looking for some relaxation or a complete makeover, my friend Sandy would be very happy to offer a pampering session in Vancouver, Canada. Please email sosareee@gmail.com for any inquiries. 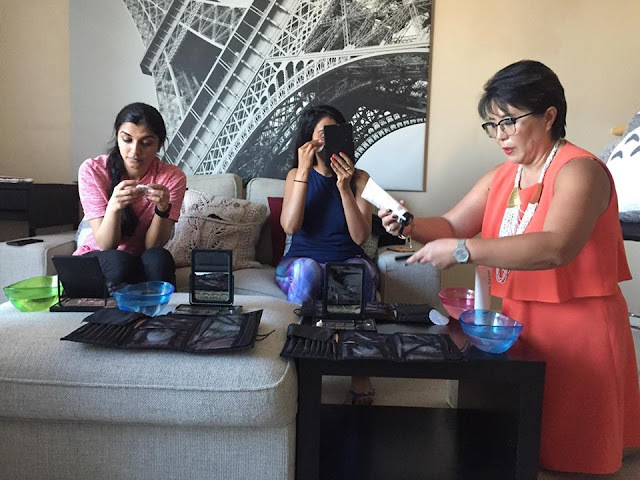 I would love to take part in such a meeting because you can choose the best cosmetics for my skin type.